The Jao Concession is a picturesque wonderland. 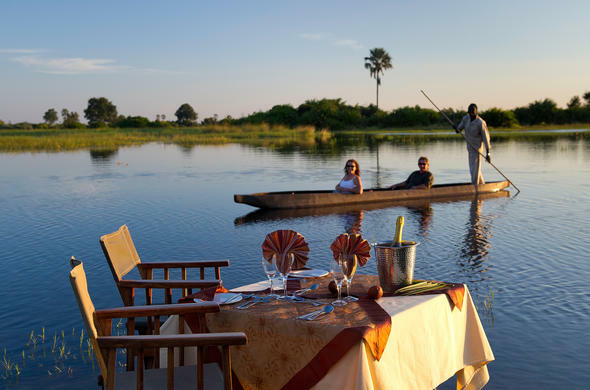 The scenery is what most people imagine they will see on their Okavango safari, with palm fringed islands, beautiful wetlands covered in Hippo grass and numerous Elephants and Wildebeest calmly feeding on the islands. The Jao Concession is situated in the northwestern region of the Delta, close to the area known as the Panhandle where the flood waters enter the Okavango Delta. The area covers 600km square which are considered to be some of the most beautiful in the Delta. The region is characterized by extensive floodplains, especially around the Jao Flats.The western areas of the reserve are drier and have habitats more typical of Kalahari scrubland. There are many areas of permanent water in the Jao Concession, but when the annual floods arrive in April and May it turns most of the concession into an aquatic wonderland. The area is typical of most people's picture of what the Okavango Delta should look like. The Jao Flats are among the most scenic areas in the Delta, and are characterized by huge open flood plains and permanent lagoons. The area has lots of round-leafed Hippo Grass, banks of common reeds and swathes of Bulrushes along the edges of the deeper channels. In slower channels the water ways are full of aquatic water plants such as Water Lettuce and pretty water lilies. The area has many small islands which have Bush Date Palms and a few Ivory Palms. There are Rain Trees, Birdplums and Waterberry trees. The drier areas of the concession have small forests of Mopane Trees and Acacia scrubland. This area has many species that are typical of the region and on an Okavango safari you may see animals such as Hippo and Crocodile, Wildebeest and Elephant. The area has a thriving population of Lechwes, and shy Bushbuck are commonly seen. In the dense reeds lining the deeper channels you may be lucky enough to encounter the rare Sitatunga antelope. The Jao Flats are also a good area to spot the Spotted Neck Otter.The western drier areas of the reserve are home to Blue Wildebeest, Zebra and Tsessebe, Impala, Kudu and Giraffe. This is the area that most of the predators are to be found as well. The concession has numerous Lions. This is due to the fact that the area used to be a hunting concession, and the populations of other predators such as Leopard and Hyena were kept down. The area no longer allows hunting, and the numbers of other predators are increasing and you can now occasionally see Leopard in the concession. The Jao Concession has fantastic birdlife, including many more uncommon and migrant species such as Pink Throated Long-claws and African Snipes. The area has many waterfowl such as Jacanas and Lesser Moorhens. In the drier areas of the concession, raptors are more common and you can see Dickenson's Kestrels, Bateleur Eagles and in the Mopane Forests Meyers Parrots. Jao Concession is beautiful year round, but it is more comfortable to enjoy water activities and bush walks in the dry season from April to November. If you are hoping to see lots of wildlife, then a good time to come is from September to November. The best way to access the camps in the Jao concession is by flying in. Driving to this concession is impractical.